Sales teams are rapidly evolving to keep up with the increasing demands of a competitive marketplace and an empowered customer. 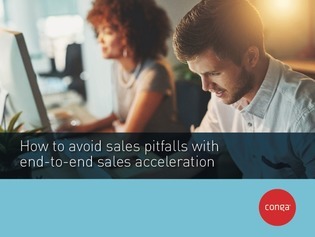 In this white paper, discover the major administrative pitfalls of sales organizations, and explore how the following integrated solutions can help sales teams achieve the end-to-end acceleration of their sales cycle. For more information on combatting sales administrative pitfalls with the above mentioned software, download this white paper, and explore how Conga can help you accelerate your sales cycle, and optimize your sales teams.